What is an HPV ? In my humble opinion, lots of vehicles are HPV's: every kind of vehicle or vessel that is used to transport people (with their freight) and that is powered by human muscle power, is an HPV. So canoes, babyprams, rollerskates: they're all HPV's. 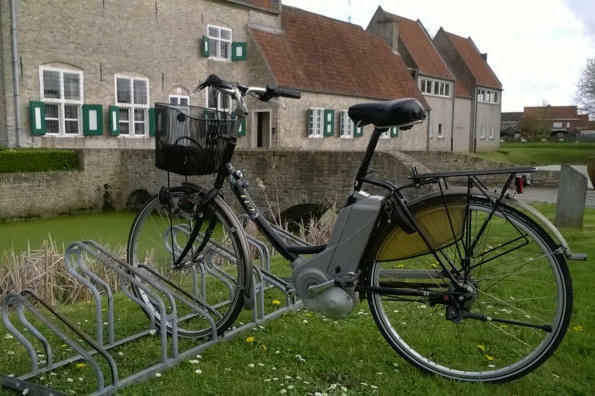 On this website, we will focus on those vehicles that have wheels (2, 3, 4,...), are not very common, and mainly used for recreation and commuting. The webmaster had a very strict education, or rather a kind of Tyrannosaurus Papus as a father. I only learned to ride a bicycle at the age of 12, thanks to a friendly neightbour. My father wasn't happy with it, and it took me two more years of asking and begging before I got my first bike. My first bicycle meant the start of a new chapter in my life. 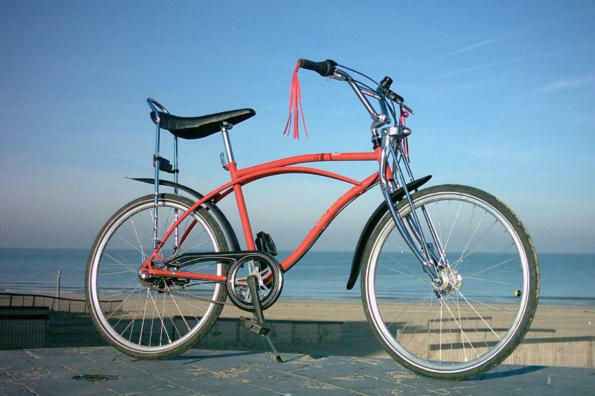 I remember it like it was yesterday: I was given a brand new, metallic blue, 10-speed 'sports bike' by the end of the schoolseason, in June 1971. My first trip was from the bike shop back home. For an unknown reason, my father bought the bike at the other end of the 'big city', Antwerp, so I had to find my way back all by myself. The 5 Miles journey was my maiden trip and it triggered an unknown sensation: FREEDOM ! The next day, I took off in the morning, and went out for what would become a routine during the next two months of holiday: an exploration of the unknown! (Don't laugh: to me it really was) I started with a short trip around the village, so that I wouldn't get too far from home if anything might go wrong with the bike. During the following days I gradually expanded the radius, and then I started to explore new horizons, i.e. the towns in the province of Antwerp. After the Summer, I must have done hundreds of miles, riding five days a week trips between 25 and 50 Miles. And that is where and how my passion for HPV's started. In 2018 that Summer of '71 is nothing but a distant blurred memory. I survived two motor bike accidents, broke two vertebrae while skiing, and had two heart-attacks.. In 2015 the dodgy ticker needed a quadruple CABG. Nowadays I a fat old man, with little dreams to fulfill. Since I have to "live" of a disability allowance, money is tight. My bike projects always start with second-hand buys, that I turn into something I like. Below are a few pics of bikes of mine, I will show more on the next pages. If you feel the urge to contact me, please feel free to use the form behind the 'contact" link. 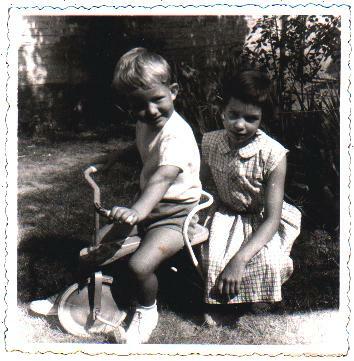 With my sister, probably in 1960. Customized with springer fork, banana seat and sissy-bar. The red leather streamers flew in from the USA! Due to heart problems, the e-bike is my favourite bike for everyday use.